The photograph of the railway, a private photo not a postcard, taken in the first or second decade of the twentieth century, shows a family sitting on the low wall which divided Parlington Lane from the elevated railway track running adjacent. 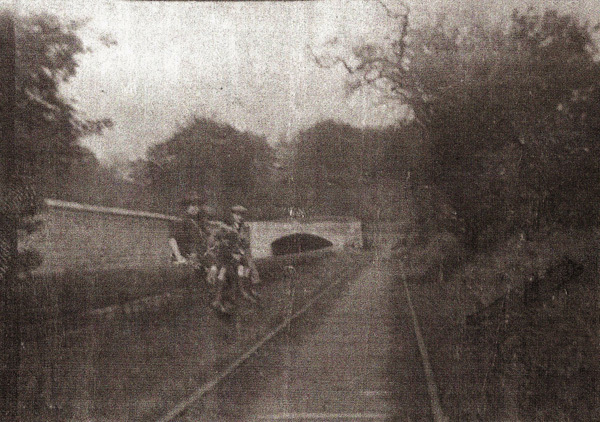 The picture was taken looking at the approach to the Dark Arch at the west end, and shows the line disappearing to the rear of the tunnel, along what was earlier the sunk fence between the Dark Arch and the Deer Park. The above photograph shows the route of the railway behind the Dark Arch as it exists today, the delightful weather battered old oak tree can be seen in the header picture as well, but in the modern view the number of branches has diminished; indeed since this photograph [March 2008] yet more branches have been lost! 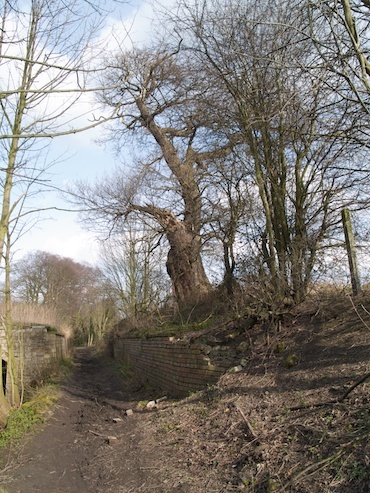 Although the view in the modern picture is nearer the entrance way to the tunnel, I have included it because it shows the deterioration of the brick wall, which is situated along the south side of the former line and supports to this day, the trees above. The brickwork is constantly pulled down by passers by and some of the stone copings have been stolen. If it was properly maintained, such as re-pointing it might be less likely to be vandalised in this way. Sadly the same can be said for all the estate walls in Parlington. 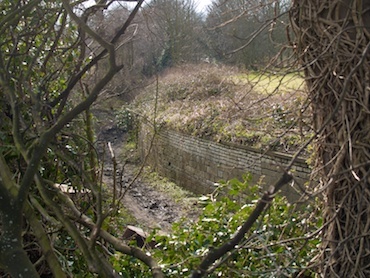 The view above shows the curvature of the former railway line following the Dark Arch.